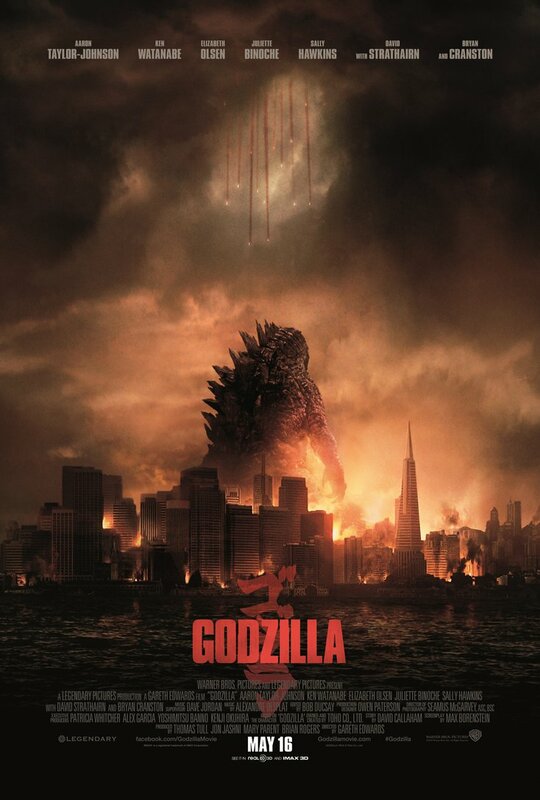 Synopsis: An epic rebirth to Toho’s iconic Godzilla, this spectacular adventure pits the world’s most famous monster against malevolent creatures who, bolstered by humanity’s scientific arrogance, threaten our very existence. Review: It’s been 16 years since Hollywood has put Godzilla on the big screen, and little wonder since the 1998 version was quite a misstep in terms of establishing the (then-planned) franchise. I’m pleased to say that the 2014 (re)incarnation is a far, far better movie. Although it hiccups in terms of human drama, Godzilla manages to deliver on most other aspects, especially on Godzilla himself, and is a very satisfying stompy movie indeed. The film does take its time to get started, with Godzilla not making a formal appearance till about the halfway point. This is largely due to Gareth Edwards attempting to ramp up the human drama in the movie, though it is somewhat unsuccessful. Despite populating the cast with an amazing amount of talent, no one actually gets to do much apart from Bryan Cranston. Ken Watanabe and Sally Hawkins are particularly wasted, reduced to nothing more than reciting expository dialogue. It is a pretty shocking waste of thespian chops, and the film would probably have done better just by focusing more on the monsters from the get-go. Where the film does succeed, however, is giving the audience the human’s-eye view of the action once it gets going. Gareth Edwards regularly films the proceedings from the perspective of the humans, and this really helps to put the audience smack in the heart of the action. One particularly impressive scene is seen through Ford’s (Aaron Taylor-Johnson) face mask as he skydives past Godzilla – it is an impossibly intimate look at the big monsters and delivers dramatic flair in spades. Kudos to the effects team as well for crafting Godzilla and monsters that look stunningly realistic (well, as realistic as we think giant monsters would look like anyway), and all the computer-generated mayhem and destruction are presented most convincingly. An excellent score by Alexander Desplat perfect augments the fantastic sound effects and mixing in the movie – it’s highly recommended that you watch Godzilla in a theatre with great acoustics, and rest assured that you can feel Godzilla’s roar in your bones if you do so. What’s not so recommended is the 3D in the movie – once again, the post-production 3D does nothing to enhance the viewing experience, and it would be better to stick to a big screen that’s devoid of the third dimension. Although this isn’t identical to the Toho Godzilla movies that some of us grew up with, Gareth Edwards has done a very commendable job in maintaining the spirit of the old movies. Sure, the science is a bit junky still, and the central humans just aren’t interesting enough, but Godzilla himself is most impressively brought to life, in a mould that’s similar to the Japanese films that he once starred in. In fact, the movie could have been significantly improved if more focus was brought onto the monsters instead of the humans, but this is so much better than Hollywood’s previous attempt that it would seem nitpicky to ask for more. This may be Edwards’ first big budget directorial effort, but he has lived up to expectations (and more), and this film more than makes up for the 1998 travesty that almost killed Godzilla for good.